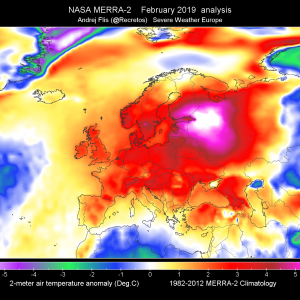 An upper trough moves into central Europe with a new surface low forming over N Italy and cold front pushed into the Mediterranean. One surface low moves from southern Scandinavia across the Baltics, another one moves from S UK along the coastal Benelux towards Denmark. 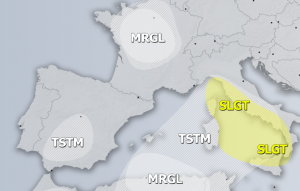 A SLGT+ risk has been issued for Ligurian and Tyrrhenian sea, Sardinia, Corsica and surroundings for heavy rain, tornadoes, severe winds and large hail. Locally, high rain amounts are likely. 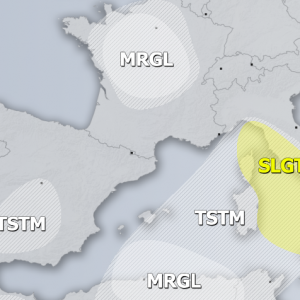 A SLGT risk has been issued for Adriatic sea, parts of N-CNTRL Italy into W Slovenia, Croatia and towards NW Albania with threat for heavy rain, severe winds and some tornado / marginal hail threat. Locally, high rain amounts are likely. 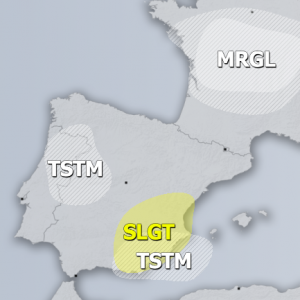 A SLGT risk has been issued for the Bay of Biscay into parts of SW France and N Spain with threat for severe winds, heavy rain and tornadoes. A SLGT risk has been issued for the Baltic sea with threat for heavy rain and strong to severe mostly non-convective winds. 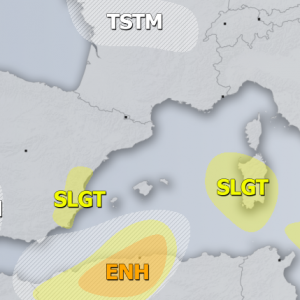 A SLGT risk has been issued for N France, Benelux into NW Germany with threat for heavy excessive rain, severe winds and some tornado threat.